City on the Elbe, six miles south of Hamburg, in the Prussian province of Hanover. Jews were not admitted to Harburg until the seventeenth century, when Duke William August (1603-1642) established a mint there which he leased in 1621 to the Jews Benedictus Bock of Itzehoe andthe brothers Meyer and Joseph Moyses of Altona. These three Jews with their families he took under his protection, allowing them not only to travel freely in his territory and to engage in trading, but also to settle in "Harborgk" (Harburg). The Harburg Jews remained under ducal jurisdiction and were not placed under municipal authority. Those Jews, also, who had business relations with the mint were granted safe-conducts. The duke issued to his Hebrew subjects patents freeing them from the poll-tax and state taxes. In March, 1622, the mint-farmers, who were in debt, fled from Harburg, whereupon the duke had them arrested at Altona; and before being set at liberty they were required to pay the costs of their confinement, and to swear that they would pay their debts and that they would never return. The same duke, on Nov. 22, 1621, had entered into a contract with Magnus Isaac of Wandsbeck and Marcus Jost of Harburg for minting at Moisburg, but they also soon became bankrupt and fled, leaving unpaid a debt of 1,400 thalers. 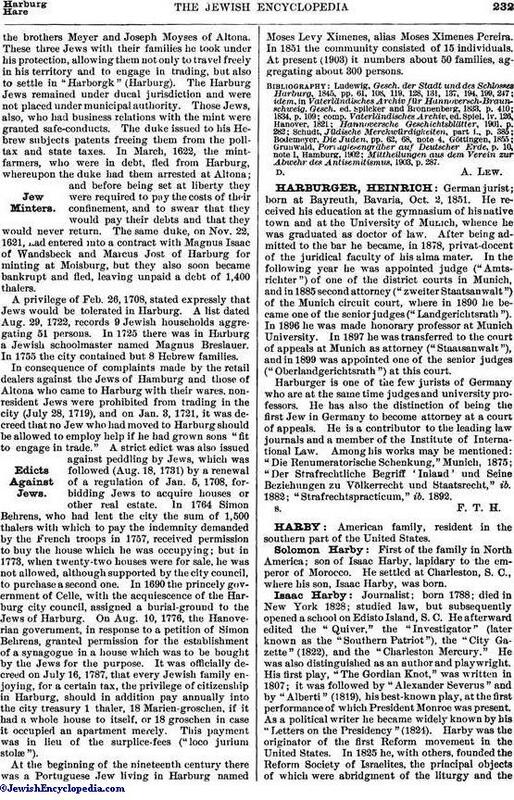 A privilege of Feb. 26, 1708, stated expressly that Jews would be tolerated in Harburg. A list dated Aug. 29, 1722, records 9 Jewish households aggregating 51 persons. In 1725 there was in Harburg a Jewish schoolmaster named Magnus Breslauer. 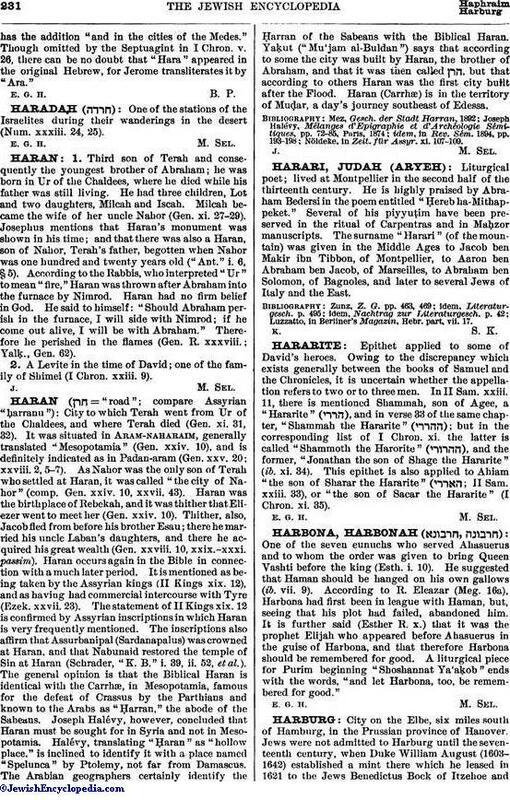 In 1755 the city contained but 8 Hebrew families. In consequence of complaints made by the retail dealers against the Jews of Hamburg and those of Altona who came to Harburg with their wares, nonresident Jews were prohibited from trading in the city (July 28, 1719), and on Jan. 3, 1721, it was decreed that no Jew who had moved to Harburg should be allowed to employ help if he had grown sons "fit to engage in trade." A strict edict was also issued against peddling by Jews, which was followed (Aug. 18, 1731) by a renewal of a regulation of Jan. 5, 1708, forbidding Jews to acquire houses or other real estate. In 1764 Simon Behrens, who had lent the city the sum of 1,500 thalers with which to pay the indemnity demanded by the French troops in 1757, received permission to buy the house which he was occupying; but in 1773, when twenty-two houses were for sale, he was not allowed, although supported by the city council, to purchase a second one. In 1690 the princely government of Celle, with the acquiescence of the Harburg city council, assigned a burial-ground to the Jews of Harburg. On Aug. 10, 1776, the Hanoverian government, in response to a petition of Simon Behrens, granted permission for the establishment of a synagogue in a house which was to be bought by the Jews for the purpose. It was officially decreed on July 16, 1787, that every Jewish family enjoying, for a certain tax, the privilege of citizenship in Harburg, should in addition pay annually into the city treasury 1 thaler, 18 Marien-groschen, if it had a whole house to itself, or 18 groschen in case it occupied an apartment merely. This payment was in lieu of the surplice-fees ("loco jurium stolæ"). At the beginning of the nineteenth century there was a Portuguese Jew living in Harburg named Moses Levy Ximenes, alias Moses Ximenes Pereira. In 1851 the community consisted of 15 individuals. At present (1903) it numbers about 50 families, aggregating about 300 persons. Mittheilungen aus dem Verein zur Abwehr des Antisemitismus, 1903, p. 287.